Classic and contemporary looking mainspring housings combine form and function, so there is no compromise in grip control even though they look great. 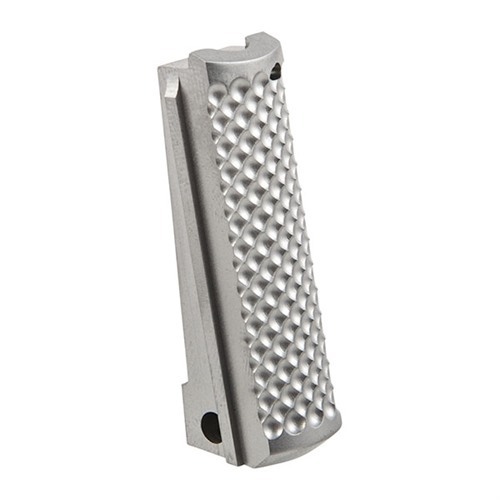 Flat shaped housings are available with popular 25 lpi checkering preferred by many shooters, as well the latest Snakeskin, Chainlink, Chainlink II and Chainlink III patterns that provide a secure gripping surf ace without the “sharpness” of machine cut checkering. Because they won’t abrade your hand or clothing, they make the perfect addition to competition, carry, and tactical guns. Some Chainlink models are also available with integral lanyard loop for attaching a weapon retention device. Traditional, Arched housing rides high in the heel of the hand to keep it close to the bore for minimal muzzle rise and excellent recoil control, and is available with a Grooved surface to provide a firm grip with little drag on clothing. Blank models are completely smooth to allow custom checkering or engraving, and are available in flat shapes. Also available for the Officer’s model in both blued and stainless steel with 25lpi checkering. SPECS: Steel, blued or stainless steel (SS) natural finish. The Government Model housing features drop-in installation in all full-size 1911 pistols including full size Para-Ordnance pistols such as the P-14 and P-16. All housings will work great with any finish or type of steel, including aluminum. Klassiske og moderne leter hovedkilden hus kombinere form og funksjon, så det er ingen kompromisser grep kontroll selv om de ser flotte. Flat formet hus er tilgjengelige med populære 25 lpi checkering foretrukket av mange skyttere, samt den nyeste slangeskinn, Chainlink, Chainlink II og Chainlink III mønstre som gir en sikker gripende surfe ess uten "skarpheten" maskinen kuttet checkering. Fordi de ikke slipes hånden eller klær, de gjør det perfekte tillegget til konkurransen, bære og taktiske våpen. Noen Chainlink modeller er også tilgjengelig med integrert lanyard løkke for å feste en våpen oppbevaring enhet. Tradisjonelle, Arched bolig ritt høy i hælen på hånden til å holde den nær bar for minimal munnkurv stige og utmerket rekyl control, og er tilgjengelig med en Grooved overflate å gi et fast grep liten dra på klær. Tom modeller er helt glatt å tillate egendefinerte checkering eller gravering, og finnes i flate figurer. Også tilgjengelig for offiser modell i både blånert og rustfritt stål med 25lpi checkering. Spesifikasjoner: stål, blånert eller rustfritt stål (SS) naturlig finish. Regjeringen modellen boliger funksjoner drop-in installasjon i alle full-size 1911 pistoler pistoler inkludert full størrelse Para Ordnance som P-14 og P-16. Alle hus vil fungere bra avslutning eller type stål, inkludert aluminium. I installed the Chainlink III mainspring housing in my Rock Island Standard CS. It required no fitting at all, and dropped right in. Fit and finish matched nicely to the rust bluing I performed on the pistol. I looked at several different mainspring housings, and I'm glad I ended up going with this one. I have a Colt XSE Lightweight and a Para GI Expert that I ordered a couple other Ed Brown mainspring housings for. I hope they drop in like this one did, but I understand some fitting is normal. The Chainlink III gives a nice positive grip feel in hand too. First the pin hole had to be slotted to the rear .045. Then the ledge on the front face (by the frame) had to be shortened by the same amount to clear the bottom of the sear spring. It would now fit into place. Then .030 had to be milled off of the bottom to make it flush with the bottom of the frame. Then it went into the garbage can. Quality built product. No fitting required on my Colt Defender .45 ACP. Easy to install (you have to use the spring assembly from your existing main spring housing). Grip and feel is now 100% better then with the (junk plastic) factory main spring housing, and it also looks way better, too. No complaints at all. As usual, fast shipping from Brownell's. Thanks! I wanted to put some stainless accents on my Kimber Warrior. This MSH fit in perfectly with no filing or fitting required. You will need to either disassemble your MSH that you are replacing or get the 1911 Auto Rebuild Kit that contains the mainspring cap, mainspring cap pin, mainspring housing retainer, and the spring. 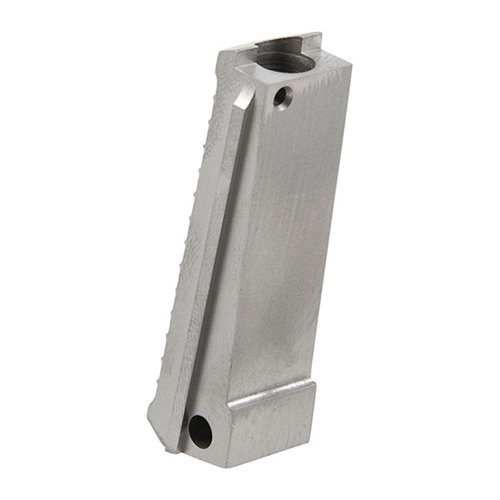 This is a perfectly machined part to use a replacement for the plastic MSH that most newer pistols come with. Mine dropped in with zero fitting required and used the OEM guts. It looks perfect and the chainlink is actually more grippy that I had anticipated (which is nice). This part mirrors my experience with other Ed Brown parts - excellent. i ordered the MS on Friday and received it on monday! wow, best shipping! now that said, for the MS chainlink by ED BROWN what can you say bad about it? NO fitting required, dropped right in to my RIA gov. looks outstanding from my view point. you can't going wrong with Mr. ED BROWN parts!! Excellent bright finish. Really brings my 1911 out. Very happy with my purchase. The EB chainlink MSH looks right at home on my Kimber Grand Raptor II. It fit perfectly and the quality is superb. The 2 "tangs" at the very top of the Ed Brown MSH are much thicker than the tangs on the stock Kimber MSH. Out of the box, the Ed Brown held my grip safety depressed enough to deactivate it (due to the thicker tangs). A little bit of careful filing on the tangs fixed it. I also chose to progressively sand the plunger bore in the MSH to smooth it out. There was a good bit of rough machining marks in there out of the box which contributed to a ridgy feel when cocking the hammer. Don't forget to clean out and grease the plunger bore before you reassemble. Overall i'm very satisfied with the quality, looks, and fit of this MSH. Just remember to function check your grip safety after the install. You may or may not have to file back the tangs on the new MSH, every 1911 is different. this is a replacement for the factory (plastic) kimber msh. the fit and finish of it is excellent. added weight is comforting during shooting and the chainlink cut is 'gentler' on the hands and yet, more 'grippy' than the original msh. while it does just 'drop in,' some fitting may be required due to the kimber's schwartz safety. nothing too major...something you can do at home. This is a very nice piece as are all of Ed Brown's stuff.It fit my Springfield GI like a glove and helped me get rid of the ILS,California lawyer friendly factory msh.Paired nicely with a S&A grip safety and gives great purchase without snagging on clothes like checkering.Very much a quality piece.Thanks Brownells! Perfect. It fit my S.A. G.I. perfectly and got rid of the ILS system. Was a perfect fit in my kimber raptor 2. I was worried I might have to do some fitting being it is out of kimbers custom shop and everything is a tight fit but slid right in. Looks nice and fits well in my hand, feels just a tiny bit fuller on the palm. I installed this on a New gun that I was comp;ltey rebuilding. It fits great and has a nice finished look against the beavertail safety that I installed a 1911 AUTO BEAVERTAIL GRIP SAFETY from Brownell's and the two look like they were fitted for a factory tight fit. They should be cleaned out in the hole where the main spring and pins go in. I clean All of mine as there was a lot of crud effecting the feel of the hammer depressing the mainspring through the strut. this MSH was a great addition to my norinco 1911A1. it fit much better than the stock one and gives my pistol the perfect grip for me. very easy to install with no fitting required. fit my springfield armory 1911 g.i. perfectly. absolutley no fitting was required. took a whole 3 minutes to swap out the old mainspring housing with the new one. worth every penny. plus, recieved two days early! great shipping! thanks brownells! I bought a blued Ed Brown arched MSH for a Colt Commander about a month ago and it was perfect. I just bought the stainless version for a Ruger SR 1911 Commander. It should have been a carbon copy of the blued model (Like the ad shows) but it is not. There is a very large bevel at the base of the new and improved model that causes the frame to poke out at each side of the base. When I called Ed Brown about it - the tech told me I would have to modify my frame to fit their part because that is how they make them now. These used to be my go-to part for carry guns but not any more. THESE ARE NO LONGER A DROP-IN FIT. I'll include a picture so you can see what I mean. My review is exactly like Bob from Orange county below. I also bought a blue one before and it was great and fit perfectly. For all I know the blue ones might still be perfect, but the SS ones definitely do not fit. I bought it any way after reading Bob's review thinking that perhaps it was his gun or maybe Ed Brown fixed their style back to the old style. But no. The beveled rear bottom seems to be the new thing and that is that. They do not fit on a standard Springfield frame. It leaves the sharp points noted in Bob's great pics. I would post pics but they are the same. It's a shame because the overall fit and finsih is far superior to any other MSH I have seen. But if it don't fit right then it don't fit right. And shooting with those sharp points would be terrible. If Ed Brown decides to go back to the correct shape then I will buy a few of them. But until then it seems that the far inferior quality S&A is the only game in town for an arched SS housing. Unlike previous reviews where folks had problems with the fit of this part, it fits perfectly for me. I replaced the factory arched msh on a 2012 built springfield armory milspec stainless. The bevel on the base of the new msh fits very well to the frame of my gun. The gun frames corners are set in just a touch and do not protrude as previous reviewers' had. It was a drop in part for me. Smooth fitting in the frame, no play and cleared the grip safety perfectly. The grooves are deep and the ridges are sharp enough to afford a solid grip, without being too sharp to be uncomfortable. Seems well made to me, and worked perfectly on my new gun. The bevel on the base of mine seems lesser than the picture below, so maybe they changed their design. Perfect fit on Kimber TLE Pro II! No modifications needed. Profile looks like it was made just for this pistol. This cured a problem I had with this pistol shooting to low/right of center of mass. Ed Brown mainspring housings are my go to when swapping out the ILS version that comes with any 1911 from Springfield. Blued or stainless. The part I received is as pictured. The geometry is as exactly as any I have purchased in the last 5 years be it a blued or stainless arched mainspring housing from Ed Brown. The part I received was as usual a prefect fit. No fitting required, dropped right in on my Springfield...but that could vary dependent upon brand. I know these fit perfect on Colt's as well. Other brands I can't say for certain. As to the 1 star reviews below. I can't say for sure what happened. I know the part I received is as exactly as pictured in the product description. It DOES NOT have any bevel at the base of the housing as Bob's review did below. I can only speculate at this point what happened on the 1 star reviews. Maybe Ed Brown had a mis-machined batch of housings that went out late last year through early this year with that bevel. Or...they received enough complaints that they went back to the standard dimensions. Again, just speculating. As to the the Ed Brown rep Bob spoke to and said "that's how they're made now." May have been true at the time, but as may of us know phone techs will tell you anything to get you off the phone due to not caring or sheer ignorance. I'm sorry two of the reviewers had a negative experience with this part. My experience been exactly opposite in this case. Again, the part I received is as exactly as pictured in the product description and couldn't be more pleased with the fit and quality. I think it's probably safe to say now...buy with confidence. I purchased this part on 11-4-14...so it's highly unlikely it was old stock. I am one of the guys below that gave a bad review because the part did not fit due to the shape/bevel at the bottom and the way it fit to the frame leaving 2 bad points that dug into your hand. After reading the more recent reviews that state that the parts shape has been changed and now fits a Springfield fine I decided to try again as my blue arched Ed Brown fits perfect. Well I can confirm now that they must have changed the shape back to the original shape and bevel because it fits my Springfield Loaded model perfectly now. No points! Fits like a glove and looks and feels great. Top quality part. The stripped mainspring housing arrived in a timely fashion, as is my usual experience with Brownell's. On inspection the part looked to be well made and free of any imperfections. It fit my new Colt Commander as it were made for it. It only took a few minutes to swap the mainspring parts from the original MSH to this one, including chasing around the retaining pin on the floor. Function testing indicated no binding or rough spots internally. Except for fumbling the retaining pin, there were no complications installing this well made part. This Commander was bought to replace a much older pistol to use for personal carry and to get back into competition. Flat housings don't it my hand well, so I usually replace them on the few 1911s I have. This is my first Ed Brown MSH and probably not my last. There were some comments about not fitting with the Springfield Armory 1911 at the bottom of the frame. Fit was perfect. Whatever was wrong has been resolved. The SA MSH was fine but I prefer arched. Would be nice if it was available in fine line checkering also, But the groves are substantial enough to provide good traction. I recently purchased three of the SS arched Ed Brown housings for my SA 1911-A1 in 9mm and 45 ACP plus my older Ruger 1911 45 ACP. The housings fit perfectly on all three pistols and eliminated the sharp bottom on the frame that always dug into the palm of my hand. I used the Brownells spring kit and the whole assy. works beautifully in all three pistols. Straight forward installation procedure with minimal tools required. A solid bench vice makes it much easier to place the spring kit inside the mainspring housing. I highly recommend both the Ed Brown arched mainspring housing and the Brownells spring kit. Great products and at a good price. Especially when you get to use a discount code and free S/H. Thanks Brownells. This is the only MSH I have found that is .539 wide. This MSH is machined v. cast and has excellent finsh. All others I have tried, (note my comments) have been far too small in each dimension to fit without a very large gap. I use this for both Gov and Officer size MSHs. It takes a lot of work to shorten it down to an officers size, but still well worth the effort for a good fit. No casting marks or irregularities and nice finish. The fit in my Kimber was perfect. I did have to trim the grip safety tabs up top to accomodate the Swartz safety, but there was plenty of metal to work with and this would be true with ANY other MSH. FWIW the arched MSH finally go me hitting the target where I wanted to. Had been high-left before. This is the second ED BROWN MSH I've installed to my personal 1911's (this installation to a Kimber Eclipse II, the first to a Kimber ProCarry II). the installation to the ProCarryII was a true drop in fit. No issues whatsoever with weapon fit and function. The installation to the Eclipse II required the most minor of fitment to insure the weapons Schwarz Safety functioned properly - nothing that 10 minutes of careful filing and polishing of the upper tangs on the MSH couldn't resolve. I shoot much better with the arched MSH, so it is a must on any 1911's that I'm carrying. Kimber weapons are beautiful and MOH accurate, and now it's SUPER top notch for me. HIGHLY RECOMMENDED PART. It was over sized in every dimension, requiring way more fitting then should have been necessary. By the time I was finished, the finish was almost completely gone due to errors on my part. I still couldn't get it to do right afterward. I am tired of grinding on it, so I am just giving up. The housing in my Para was plastic. After removing the plungers, spring and pin from the old one, they installed in the new one perfectly. The complete assembly slid onto the gun with no binding. and feels great in the hand. The internal parts fit in the housing without drag or slop, the housing fit the frame of my S&W 1911 perfectly, no modification required. It took no more than 15 minutes from start to finish.. I bought this to install on a Colt series 80 to replace the flat polymer factory unit. Ed Brown obviously based his measurements from Colt factory specs. It slid right in, no wobble, no gaps and all the transition areas on the bottom edge of the frame line up perfectly. It has a nice machined finish and is not a casting. I installed this Ed Brown arched mainspring housing in my Para GI Expert to replace the plastic mainspring housing that was in it from the factory. It needed just a small amount of fitting on top of the mainspring housing for the grip safety to work properly. This wasn't a problem as I knew going in there was a chance of it needing fitted, and it took all of 5 minutes to do. All other aspects of this mainspring housing fit properly, and it works perfectly. The finish was nicely done, and there were no issues with this mainspring housing at all. This is the second Ed Brown mainspring housing I have used, and I'm glad I chose this manufacturer. This product dropped right in to my MK IV Gov't Model and really improved the look and feel of the pistol. The checkering is sharp and defined. A must have to replace your plastic housing. This was bought to put on a Sig XO. It didnt require fitting. The quality is very high, the checkering is superbly executed. It doesnt come with a spring, plunger, or pin. Easy to tell its a quality piece when you have it in hand. Installed this in my Colt 1991-A1 and it fit perfect. Nice quality work on the part. Sure beats the plastic factory piece. I installed this Ed Brown mainspring housing in my Colt XSE Lightweight to replace the plastic mainspring housing that came in it from the factory. It took just a small amount of fitting on the top of it (five minutes at the most) for the grip safety to work properly. All other aspects of this mainspring housing fit perfectly, and the finish is nice also. I was looking forward to how the 25 LPI checkering would feel, and it did not disappoint when it was installed. It gives a very good grip feel in hand. This is the third Ed Brown mainspring housing I've used, and I would not hesitate to use them or recommend them. Very good product for the money! part drops right in with minor fitting of old or new components and looks awsome polished to a mirror/chrome shine. bought this to replace the original replacment part that was plastic. this one has much better finish and took just a bit of fitting because it is so tight. much better part than the dull to long one i pulled back out. Replaced the plastic housing in Kimber Custom. I was concerned about the smooth finish and grip, no problem. Color, fit (slide right in), and function excellent. This fit perfectly with no filing, no sanding, no loss of bluing, no drilling, and was installed in less than five minutes. I'd tried two other brands, both required substantial fitting,and one of those never did fit. Start with this one. I bought this mainspring housing for my 30's era 1911A1 and I love it! It required no fitting, feels better than the arched MSH, didn't interfere with reliability and it looks cool! As with a lot of mainspring housings, they do not come with the internal parts so I recommend the Brownells Mainspring Housing Rebuild Kit (080-000-549WB)! I have a colt govt competition model in 9mm and it comes stock with a plastic mainspring housing that I did not like. I bought this one and took out all the mainspring housing parts from the old part and installed them in this new one. Installed this new part and it was a true drop in fit. No sanding or grinding needed. No gunsmith at all. Looks absolutely perfect on my Kimber Stainless II. Provides a little more grip than the cheap plastic MSH that came stock, and the finish is spot on. As with most 1911 parts, it did require minor fitting. Worth every penny and then some. This part took only minutes to install on my SA 1911. It looks great, fits great and feels great. It provides better grip than my stock arched MSH and gives my 1911 a great detailed look. Installed very easy on my norinco 1911. Looks and feels great. Put on my Para GI Expert. It looks mean, but it does little to hold your hand in place. Checkering would be better. Requires fitting. I spent an hour with a file getting it right. Like I said, it looks great, but it does little else. After about a year I started noticing some rust across the face of the scales. It got worse with time - as rust tends to do. My Springfield 1911-A1 is all steel and phosphate coated - this is the only part that is exhibiting any rust. My hands don't sweat particularly much. Aside from the rust it's quite well built and installed very easily. This is a sharp looking part but it will take some time and filework to fit it up with the para expert. it looks great on the gun. Produsentnr. : 817C2 800732818122 Klassiske og moderne leter hovedkilden hus kombinere form og funksjon, så det er ingen kompromisser grep kontroll selv om de ser flotte. Flat formet hus er tilgjengelige med populære 25 lpi checkering foretrukket av mange skyttere, samt den nyeste slangeskinn, Chainlink, Chainlink II og Chainlink III mønstre som gir en sikker gripende surfe ess uten "skarpheten" maskinen kuttet checkering. Fordi de ikke slipes hånden eller klær, de gjør det perfekte tillegget til konkurransen, bære og taktiske våpen. Noen Chainlink modeller er også tilgjengelig med integrert lanyard løkke for å feste en våpen oppbevaring enhet. Tradisjonelle, Arched bolig ritt høy i hælen på hånden til å holde den nær bar for minimal munnkurv stige og utmerket rekyl control, og er tilgjengelig med en Grooved overflate å gi et fast grep liten dra på klær. Tom modeller er helt glatt å tillate egendefinerte checkering eller gravering, og finnes i flate figurer. Også tilgjengelig for offiser modell i både blånert og rustfritt stål med 25lpi checkering. Produsentnr. : 816S 800732816074 Klassiske og moderne leter hovedkilden hus kombinere form og funksjon, så det er ingen kompromisser grep kontroll selv om de ser flotte. Flat formet hus er tilgjengelige med populære 25 lpi checkering foretrukket av mange skyttere, samt den nyeste slangeskinn, Chainlink, Chainlink II og Chainlink III mønstre som gir en sikker gripende surfe ess uten "skarpheten" maskinen kuttet checkering. Fordi de ikke slipes hånden eller klær, de gjør det perfekte tillegget til konkurransen, bære og taktiske våpen. Noen Chainlink modeller er også tilgjengelig med integrert lanyard løkke for å feste en våpen oppbevaring enhet. Tradisjonelle, Arched bolig ritt høy i hælen på hånden til å holde den nær bar for minimal munnkurv stige og utmerket rekyl control, og er tilgjengelig med en Grooved overflate å gi et fast grep liten dra på klær. Tom modeller er helt glatt å tillate egendefinerte checkering eller gravering, og finnes i flate figurer. Også tilgjengelig for offiser modell i både blånert og rustfritt stål med 25lpi checkering. Produsentnr. : 817S 800732817071 Klassiske og moderne leter hovedkilden hus kombinere form og funksjon, så det er ingen kompromisser grep kontroll selv om de ser flotte. Flat formet hus er tilgjengelige med populære 25 lpi checkering foretrukket av mange skyttere, samt den nyeste slangeskinn, Chainlink, Chainlink II og Chainlink III mønstre som gir en sikker gripende surfe ess uten "skarpheten" maskinen kuttet checkering. Fordi de ikke slipes hånden eller klær, de gjør det perfekte tillegget til konkurransen, bære og taktiske våpen. Noen Chainlink modeller er også tilgjengelig med integrert lanyard løkke for å feste en våpen oppbevaring enhet. Tradisjonelle, Arched bolig ritt høy i hælen på hånden til å holde den nær bar for minimal munnkurv stige og utmerket rekyl control, og er tilgjengelig med en Grooved overflate å gi et fast grep liten dra på klær. Tom modeller er helt glatt å tillate egendefinerte checkering eller gravering, og finnes i flate figurer. Også tilgjengelig for offiser modell i både blånert og rustfritt stål med 25lpi checkering. Produsentnr. : 816F 800732816005 Klassiske og moderne leter hovedkilden hus kombinere form og funksjon, så det er ingen kompromisser grep kontroll selv om de ser flotte. Flat formet hus er tilgjengelige med populære 25 lpi checkering foretrukket av mange skyttere, samt den nyeste slangeskinn, Chainlink, Chainlink II og Chainlink III mønstre som gir en sikker gripende surfe ess uten "skarpheten" maskinen kuttet checkering. Fordi de ikke slipes hånden eller klær, de gjør det perfekte tillegget til konkurransen, bære og taktiske våpen. Noen Chainlink modeller er også tilgjengelig med integrert lanyard løkke for å feste en våpen oppbevaring enhet. Tradisjonelle, Arched bolig ritt høy i hælen på hånden til å holde den nær bar for minimal munnkurv stige og utmerket rekyl control, og er tilgjengelig med en Grooved overflate å gi et fast grep liten dra på klær. Tom modeller er helt glatt å tillate egendefinerte checkering eller gravering, og finnes i flate figurer. Også tilgjengelig for offiser modell i både blånert og rustfritt stål med 25lpi checkering. Produsentnr. : 817F 800732817002 Klassiske og moderne leter hovedkilden hus kombinere form og funksjon, så det er ingen kompromisser grep kontroll selv om de ser flotte. Flat formet hus er tilgjengelige med populære 25 lpi checkering foretrukket av mange skyttere, samt den nyeste slangeskinn, Chainlink, Chainlink II og Chainlink III mønstre som gir en sikker gripende surfe ess uten "skarpheten" maskinen kuttet checkering. Fordi de ikke slipes hånden eller klær, de gjør det perfekte tillegget til konkurransen, bære og taktiske våpen. Noen Chainlink modeller er også tilgjengelig med integrert lanyard løkke for å feste en våpen oppbevaring enhet. Tradisjonelle, Arched bolig ritt høy i hælen på hånden til å holde den nær bar for minimal munnkurv stige og utmerket rekyl control, og er tilgjengelig med en Grooved overflate å gi et fast grep liten dra på klær. Tom modeller er helt glatt å tillate egendefinerte checkering eller gravering, og finnes i flate figurer. Også tilgjengelig for offiser modell i både blånert og rustfritt stål med 25lpi checkering. Produsentnr. : 816F25 800732816098 Klassiske og moderne leter hovedkilden hus kombinere form og funksjon, så det er ingen kompromisser grep kontroll selv om de ser flotte. Flat formet hus er tilgjengelige med populære 25 lpi checkering foretrukket av mange skyttere, samt den nyeste slangeskinn, Chainlink, Chainlink II og Chainlink III mønstre som gir en sikker gripende surfe ess uten "skarpheten" maskinen kuttet checkering. Fordi de ikke slipes hånden eller klær, de gjør det perfekte tillegget til konkurransen, bære og taktiske våpen. Noen Chainlink modeller er også tilgjengelig med integrert lanyard løkke for å feste en våpen oppbevaring enhet. Tradisjonelle, Arched bolig ritt høy i hælen på hånden til å holde den nær bar for minimal munnkurv stige og utmerket rekyl control, og er tilgjengelig med en Grooved overflate å gi et fast grep liten dra på klær. Tom modeller er helt glatt å tillate egendefinerte checkering eller gravering, og finnes i flate figurer. Også tilgjengelig for offiser modell i både blånert og rustfritt stål med 25lpi checkering. Produsentnr. : 817F25 800732817095 Klassiske og moderne leter hovedkilden hus kombinere form og funksjon, så det er ingen kompromisser grep kontroll selv om de ser flotte. Flat formet hus er tilgjengelige med populære 25 lpi checkering foretrukket av mange skyttere, samt den nyeste slangeskinn, Chainlink, Chainlink II og Chainlink III mønstre som gir en sikker gripende surfe ess uten "skarpheten" maskinen kuttet checkering. Fordi de ikke slipes hånden eller klær, de gjør det perfekte tillegget til konkurransen, bære og taktiske våpen. Noen Chainlink modeller er også tilgjengelig med integrert lanyard løkke for å feste en våpen oppbevaring enhet. Tradisjonelle, Arched bolig ritt høy i hælen på hånden til å holde den nær bar for minimal munnkurv stige og utmerket rekyl control, og er tilgjengelig med en Grooved overflate å gi et fast grep liten dra på klær. Tom modeller er helt glatt å tillate egendefinerte checkering eller gravering, og finnes i flate figurer. Også tilgjengelig for offiser modell i både blånert og rustfritt stål med 25lpi checkering. Produsentnr. : 816ARCH 800732816111 Klassiske og moderne leter hovedkilden hus kombinere form og funksjon, så det er ingen kompromisser grep kontroll selv om de ser flotte. Flat formet hus er tilgjengelige med populære 25 lpi checkering foretrukket av mange skyttere, samt den nyeste slangeskinn, Chainlink, Chainlink II og Chainlink III mønstre som gir en sikker gripende surfe ess uten "skarpheten" maskinen kuttet checkering. Fordi de ikke slipes hånden eller klær, de gjør det perfekte tillegget til konkurransen, bære og taktiske våpen. Noen Chainlink modeller er også tilgjengelig med integrert lanyard løkke for å feste en våpen oppbevaring enhet. Tradisjonelle, Arched bolig ritt høy i hælen på hånden til å holde den nær bar for minimal munnkurv stige og utmerket rekyl control, og er tilgjengelig med en Grooved overflate å gi et fast grep liten dra på klær. Tom modeller er helt glatt å tillate egendefinerte checkering eller gravering, og finnes i flate figurer. Også tilgjengelig for offiser modell i både blånert og rustfritt stål med 25lpi checkering. Produsentnr. : 817ARCH 800732817118 Klassiske og moderne leter hovedkilden hus kombinere form og funksjon, så det er ingen kompromisser grep kontroll selv om de ser flotte. Flat formet hus er tilgjengelige med populære 25 lpi checkering foretrukket av mange skyttere, samt den nyeste slangeskinn, Chainlink, Chainlink II og Chainlink III mønstre som gir en sikker gripende surfe ess uten "skarpheten" maskinen kuttet checkering. Fordi de ikke slipes hånden eller klær, de gjør det perfekte tillegget til konkurransen, bære og taktiske våpen. Noen Chainlink modeller er også tilgjengelig med integrert lanyard løkke for å feste en våpen oppbevaring enhet. Tradisjonelle, Arched bolig ritt høy i hælen på hånden til å holde den nær bar for minimal munnkurv stige og utmerket rekyl control, og er tilgjengelig med en Grooved overflate å gi et fast grep liten dra på klær. Tom modeller er helt glatt å tillate egendefinerte checkering eller gravering, og finnes i flate figurer. Også tilgjengelig for offiser modell i både blånert og rustfritt stål med 25lpi checkering. Produsentnr. : 816C 800732816142 Klassiske og moderne leter hovedkilden hus kombinere form og funksjon, så det er ingen kompromisser grep kontroll selv om de ser flotte. Flat formet hus er tilgjengelige med populære 25 lpi checkering foretrukket av mange skyttere, samt den nyeste slangeskinn, Chainlink, Chainlink II og Chainlink III mønstre som gir en sikker gripende surfe ess uten "skarpheten" maskinen kuttet checkering. Fordi de ikke slipes hånden eller klær, de gjør det perfekte tillegget til konkurransen, bære og taktiske våpen. Noen Chainlink modeller er også tilgjengelig med integrert lanyard løkke for å feste en våpen oppbevaring enhet. Tradisjonelle, Arched bolig ritt høy i hælen på hånden til å holde den nær bar for minimal munnkurv stige og utmerket rekyl control, og er tilgjengelig med en Grooved overflate å gi et fast grep liten dra på klær. Tom modeller er helt glatt å tillate egendefinerte checkering eller gravering, og finnes i flate figurer. Også tilgjengelig for offiser modell i både blånert og rustfritt stål med 25lpi checkering. Produsentnr. : 817C 800732817149 Klassiske og moderne leter hovedkilden hus kombinere form og funksjon, så det er ingen kompromisser grep kontroll selv om de ser flotte. Flat formet hus er tilgjengelige med populære 25 lpi checkering foretrukket av mange skyttere, samt den nyeste slangeskinn, Chainlink, Chainlink II og Chainlink III mønstre som gir en sikker gripende surfe ess uten "skarpheten" maskinen kuttet checkering. Fordi de ikke slipes hånden eller klær, de gjør det perfekte tillegget til konkurransen, bære og taktiske våpen. Noen Chainlink modeller er også tilgjengelig med integrert lanyard løkke for å feste en våpen oppbevaring enhet. Tradisjonelle, Arched bolig ritt høy i hælen på hånden til å holde den nær bar for minimal munnkurv stige og utmerket rekyl control, og er tilgjengelig med en Grooved overflate å gi et fast grep liten dra på klær. Tom modeller er helt glatt å tillate egendefinerte checkering eller gravering, og finnes i flate figurer. Også tilgjengelig for offiser modell i både blånert og rustfritt stål med 25lpi checkering. Produsentnr. : 816C2 800732818108 Klassiske og moderne leter hovedkilden hus kombinere form og funksjon, så det er ingen kompromisser grep kontroll selv om de ser flotte. Flat formet hus er tilgjengelige med populære 25 lpi checkering foretrukket av mange skyttere, samt den nyeste slangeskinn, Chainlink, Chainlink II og Chainlink III mønstre som gir en sikker gripende surfe ess uten "skarpheten" maskinen kuttet checkering. Fordi de ikke slipes hånden eller klær, de gjør det perfekte tillegget til konkurransen, bære og taktiske våpen. Noen Chainlink modeller er også tilgjengelig med integrert lanyard løkke for å feste en våpen oppbevaring enhet. Tradisjonelle, Arched bolig ritt høy i hælen på hånden til å holde den nær bar for minimal munnkurv stige og utmerket rekyl control, og er tilgjengelig med en Grooved overflate å gi et fast grep liten dra på klær. Tom modeller er helt glatt å tillate egendefinerte checkering eller gravering, og finnes i flate figurer. Også tilgjengelig for offiser modell i både blånert og rustfritt stål med 25lpi checkering. Produsentnr. : 817SKIP 800732818160 Klassiske og moderne leter hovedkilden hus kombinere form og funksjon, så det er ingen kompromisser grep kontroll selv om de ser flotte. Flat formet hus er tilgjengelige med populære 25 lpi checkering foretrukket av mange skyttere, samt den nyeste slangeskinn, Chainlink, Chainlink II og Chainlink III mønstre som gir en sikker gripende surfe ess uten "skarpheten" maskinen kuttet checkering. Fordi de ikke slipes hånden eller klær, de gjør det perfekte tillegget til konkurransen, bære og taktiske våpen. Noen Chainlink modeller er også tilgjengelig med integrert lanyard løkke for å feste en våpen oppbevaring enhet. Tradisjonelle, Arched bolig ritt høy i hælen på hånden til å holde den nær bar for minimal munnkurv stige og utmerket rekyl control, og er tilgjengelig med en Grooved overflate å gi et fast grep liten dra på klær. Tom modeller er helt glatt å tillate egendefinerte checkering eller gravering, og finnes i flate figurer. Også tilgjengelig for offiser modell i både blånert og rustfritt stål med 25lpi checkering. Produsentnr. : 81625OF 800732819075 Klassiske og moderne leter hovedkilden hus kombinere form og funksjon, så det er ingen kompromisser grep kontroll selv om de ser flotte. Flat formet hus er tilgjengelige med populære 25 lpi checkering foretrukket av mange skyttere, samt den nyeste slangeskinn, Chainlink, Chainlink II og Chainlink III mønstre som gir en sikker gripende surfe ess uten "skarpheten" maskinen kuttet checkering. Fordi de ikke slipes hånden eller klær, de gjør det perfekte tillegget til konkurransen, bære og taktiske våpen. Noen Chainlink modeller er også tilgjengelig med integrert lanyard løkke for å feste en våpen oppbevaring enhet. Tradisjonelle, Arched bolig ritt høy i hælen på hånden til å holde den nær bar for minimal munnkurv stige og utmerket rekyl control, og er tilgjengelig med en Grooved overflate å gi et fast grep liten dra på klær. Tom modeller er helt glatt å tillate egendefinerte checkering eller gravering, og finnes i flate figurer. Også tilgjengelig for offiser modell i både blånert og rustfritt stål med 25lpi checkering. Produsentnr. : 81725OF 800732819112 Klassiske og moderne leter hovedkilden hus kombinere form og funksjon, så det er ingen kompromisser grep kontroll selv om de ser flotte. Flat formet hus er tilgjengelige med populære 25 lpi checkering foretrukket av mange skyttere, samt den nyeste slangeskinn, Chainlink, Chainlink II og Chainlink III mønstre som gir en sikker gripende surfe ess uten "skarpheten" maskinen kuttet checkering. Fordi de ikke slipes hånden eller klær, de gjør det perfekte tillegget til konkurransen, bære og taktiske våpen. Noen Chainlink modeller er også tilgjengelig med integrert lanyard løkke for å feste en våpen oppbevaring enhet. Tradisjonelle, Arched bolig ritt høy i hælen på hånden til å holde den nær bar for minimal munnkurv stige og utmerket rekyl control, og er tilgjengelig med en Grooved overflate å gi et fast grep liten dra på klær. Tom modeller er helt glatt å tillate egendefinerte checkering eller gravering, og finnes i flate figurer. Også tilgjengelig for offiser modell i både blånert og rustfritt stål med 25lpi checkering. Produsentnr. : 816C3 800732816319 Klassiske og moderne leter hovedkilden hus kombinere form og funksjon, så det er ingen kompromisser grep kontroll selv om de ser flotte. Flat formet hus er tilgjengelige med populære 25 lpi checkering foretrukket av mange skyttere, samt den nyeste slangeskinn, Chainlink, Chainlink II og Chainlink III mønstre som gir en sikker gripende surfe ess uten "skarpheten" maskinen kuttet checkering. Fordi de ikke slipes hånden eller klær, de gjør det perfekte tillegget til konkurransen, bære og taktiske våpen. Noen Chainlink modeller er også tilgjengelig med integrert lanyard løkke for å feste en våpen oppbevaring enhet. Tradisjonelle, Arched bolig ritt høy i hælen på hånden til å holde den nær bar for minimal munnkurv stige og utmerket rekyl control, og er tilgjengelig med en Grooved overflate å gi et fast grep liten dra på klær. Tom modeller er helt glatt å tillate egendefinerte checkering eller gravering, og finnes i flate figurer. Også tilgjengelig for offiser modell i både blånert og rustfritt stål med 25lpi checkering. Produsentnr. : 817C3 800732817316 Klassiske og moderne leter hovedkilden hus kombinere form og funksjon, så det er ingen kompromisser grep kontroll selv om de ser flotte. Flat formet hus er tilgjengelige med populære 25 lpi checkering foretrukket av mange skyttere, samt den nyeste slangeskinn, Chainlink, Chainlink II og Chainlink III mønstre som gir en sikker gripende surfe ess uten "skarpheten" maskinen kuttet checkering. Fordi de ikke slipes hånden eller klær, de gjør det perfekte tillegget til konkurransen, bære og taktiske våpen. Noen Chainlink modeller er også tilgjengelig med integrert lanyard løkke for å feste en våpen oppbevaring enhet. Tradisjonelle, Arched bolig ritt høy i hælen på hånden til å holde den nær bar for minimal munnkurv stige og utmerket rekyl control, og er tilgjengelig med en Grooved overflate å gi et fast grep liten dra på klær. Tom modeller er helt glatt å tillate egendefinerte checkering eller gravering, og finnes i flate figurer. Også tilgjengelig for offiser modell i både blånert og rustfritt stål med 25lpi checkering.